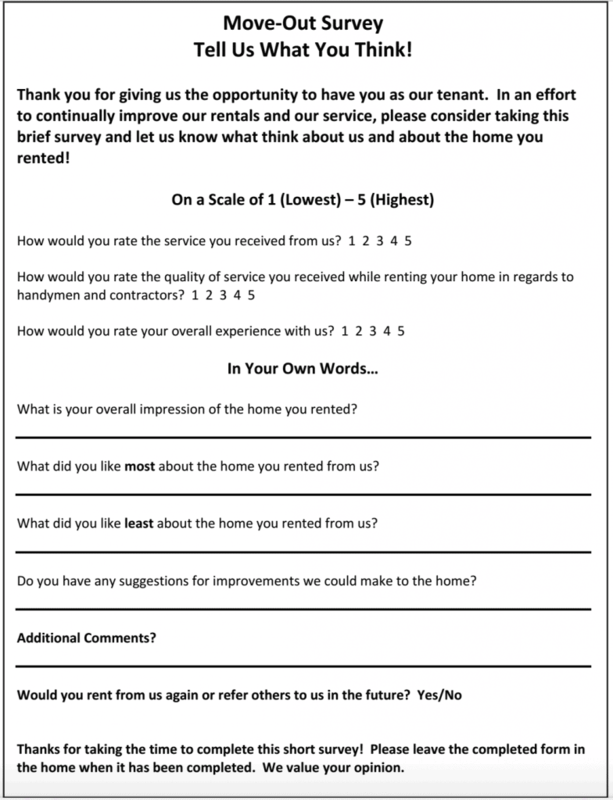 Do you use a move-out survey? If so, is it similar to the one above? If I was a tenant and had a survey to fill out, it would go in file 13. One of my pet peeves is having to answer questions about a service that the person or persons giving to me should already know the answer to. A survey is wasting my time and energy that I could be using on other things. If they have a question about their service, call me and I’ll let them know point blank how I feel about it. I never have and never will be one to beat around the bush about things. If you don’t want to know my honest answer, don’t ask the question. If you do want my honest answer ask me in person, not by way of a piece of paper. That’s like saying hey, I want your honest opinion but I’m afraid to ask you for it in person. Not trying to sound like a jerk, just the way I view surveys in general. My last rental residence was managed by a property manager. When I moved out, they had a form that they used to collect my forwarding information and it had a few survey questions on it. Basically, what suggestions would you give us and why are you moving. And, I had the ability to just not answer. But, I actually appreciated that they gave me an opportunity to voice my issues. If I was the owner of the property, I would be interested in knowing why my tenants were leaving. If you have a good tenant, the whole point is to try to keep them in the property as long as possible and reduce turn-over right? The sole reason that I was leaving was that the rent kept increasing year over year, at a rate faster than the market was bearing at the time. I was honest with them that that is why I was leaving. I was also frank with the fact that I would have stayed if they hadn’t kept jacking the rent up. As it was, I lived in their property for about 2.5 years, maintained the property like I owned it, and the most they ever spent on the property was replacing the kitchen sink (probably $100, if that). Maybe I think I’m more important than I am, but I believe that the information I left was valuable feedback for them. You sound like a great tenant but replacing a kitchen sink is much more than $100 even when the work is performed by the handyman and not the plumber. Kitchen sinks cost more than $100. In my area a handyman is $25 to $35 an hour and most have a 2 hour minimum. Plumbers start at around $85/hour. The landlord should expect things to fail and need to be replaced. They should never charge their good tenants above market rent. Sounds like your landlord was trying to leverage that moving takes work/time to get above market rent and you were justified finding a better landlord. I didn’t explain it well… They didn’t replace the kitchen sink. They only replaced the faucet portion.